A couple of ducks were fighting over some chicks. This one couldn't handle it and fled. It is airborne only for a few seconds now, but up to speed, I had to pan (follow the subject while exposing) pretty fast. It was flapping its wings like mad, but fortunately the shutter captured a full wingspread so I had the perfect symmetery of the wings and tail. It was cool to actually capture the duck 4 times during the pan, it moved sooo fast! Gives me some hope for the motorcycle race I will be attending next week. And the camera was able to get a focus lock during the panning........ 602's rock! Cameratech: -2/3 exposure bias, aperture priority, 5 frames per second continious shooting, auto whitebalance, UV filter, full telezoom (210mm eqv). Post-processing: Cropped a very small part out of the original frame. I was already at the end of the zoom so much of the frame is empty space. Resampled. Unsharp masked. Save for the web. Just as a thought.....chop this image so only to enclude the top of the top wing (that is the symetric fan shape), with a little of the teal/blue of the wing for interest. Nice focus on the mallard. I think this is a great shot, but the blurring background blends with the wings a little and distracts me from the subject. This is a nice pan focus shot, but I wonder how it would look if a higher shutter speed could have been used to stop the motion of the background as well. 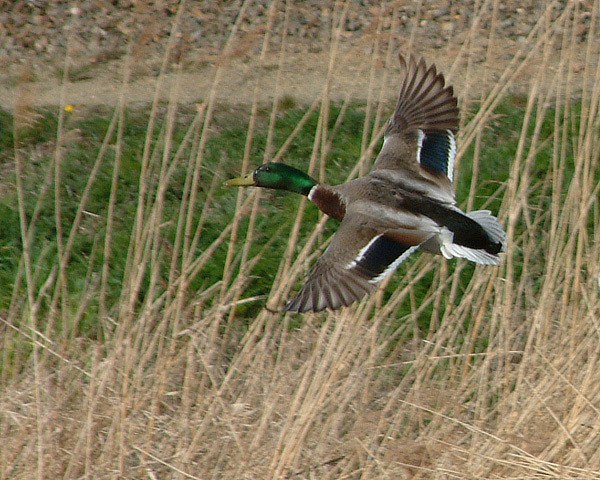 I try to shoot ducks in flight frequently -- it's not all that easy. Good job! Amazing shot! Great balance on the wings and very solid sharpness and focus in the rest of the shot. Duck in nicle in focus. I wish the backgorund were less cluttered and the angle showed the symmetry. This is beautifully done. Perhaps the background could be digitally darkened, lightened or blurred for more effect. Nice capture and conforms well to the topic. Great capture. But I'm not carried away with the title to meet the challenge. Lovely shot - the image itself isn't symmetrical but I see the symmetry at which you're pointing. You've done very well to catch the duck in motion with such clarity. The wings are symmetrical, too! 8. Proudly hosted by Sargasso Networks. Current Server Time: 04/26/2019 03:41:59 AM EDT.